Enjoying your single life? Well, most bachelors do! If you have a pad all to yourself, you can pretty much transform any space into a cool and contemporary room to your liking. Unfortunately, most men may not have the designer's touch, so don't be afraid to pick up a home magazine or go online for some inspiration. You might also want to start small - in other words, head straight to your bathroom. For that contemporary and almost industrial look, check out bathroom accessories in chrome or stainless steel. Nothing says 'man' more than a cool-looking faucet or a shower panel that looks like it belongs on the Enterprise. Just make sure to keep the major bathroom fixtures like the toilet and the bathtub neutral. 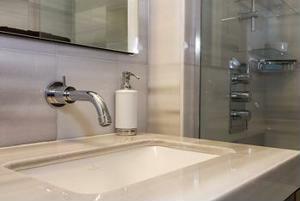 Also keep the bathroom vanity minimal and void of fussy detailing. For some additional accents, think about what you could do to the walls. If you're into that industrial aesthetic, you could check out faux brick paneling that mimics the look of those cool red bricks found in old buildings. You can also install faux tin ceilings for some added pizzazz.